Are your courses approved by the State? I'm not computer savvy should I take your courses? What have some of your students said about your courses? Is your package really the least expensive? What is the "Referral Discount"? What is the four-day study period? What are your textbooks like? What purpose do the	quizzes serve? What are the final exams like? How does the 15-Credits-Per-Day Rule work? What should I do if I fail the first final exam? What happens when I fail the final exam twice? 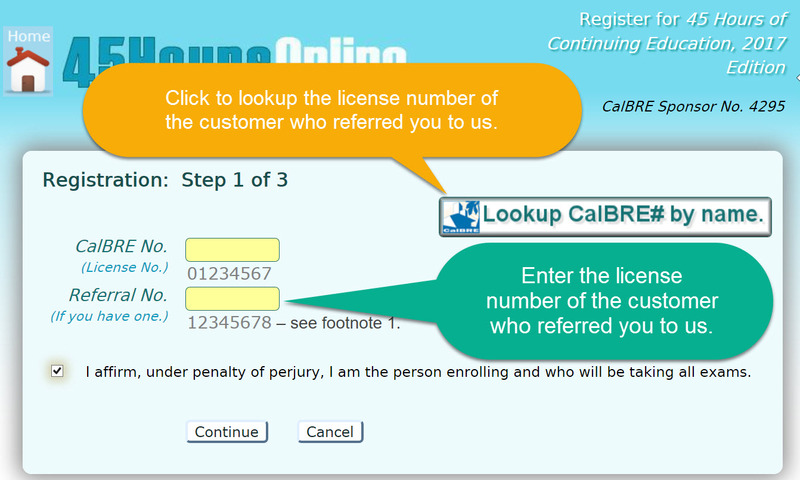 What must I do to renew my license online? How can I pass your package in as little as six days? Do you have a final final? What if DRE’s renewal site is down on my license expiration day? When may I take CE and when may I renew my license? Can I	apply the surplus to my next renewal? Can I be exempted from taking continuing education? Will you grant me an exclusion from DRE’s waiting periods? Why won't you let me see which answers I got wrong? What are the advantages to eBooks in PDF format? How do I take an exam with an open PDF book? How long do you keep your records? How do I send my evaluation to the DRE? This site went online May 2006. Its purpose is to provide convenient continuing education to California real estate licensees. 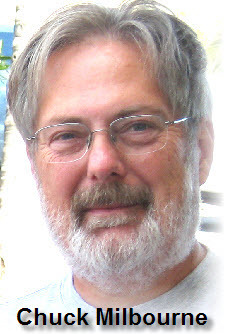 Chuck Milbourne is 45HourOnline’s owner, textbook author, and website developer. Prior to his founding of 45HoursOnline, he was a computer application developer for thirty years. In 2005, he began development of this site while studying real estate. By 2006 he earned his broker’s license and went live with this site. If you need to speak with him, he will be sure to answer your questions correctly and succinctly (45HoursOnline@pobox.com or 818/716-1028). Cheap : We know of no other continuing education (CE) school offering complete renewal packages at prices lower than ours (details). Our prices are low because our site is automated, our overhead minimal, and we own our course materials. Fast and Easy : We designed our site for convenience and ease-of-use. Unlimited Course Retakes : Unlike most of our competitors, should you fail a final exam twice in succession we do not charge you to re-register for the course or package. Should you fail any exam twice in succession, you must start from the beginning; that is we re-impose the study period for the course you failed. The study period is three hours for our three-hour courses and two days (48 hours) for our 15-hour exams. For example, should you fail the exam for our three-hour Ethics course twice in succession, then we do not permit you to retake the exam, or any exam, for at least three hours. Specialized: We provide CE only to California real estate licensees. In contrast to most CE providers, we do not offer courses to agents licensed by other states and we do not offer pre-license courses needed to sit for DRE’s licensing exams. We do not, unlike most of the larger schools, offer CE for other licensed professionals such as appraisers, contractors, and insurance brokers. Because we are specialized, we keep current with California residential real estate law and our course materials are specific to California residential real estate brokerage. Above Board : Unlike most other schools, we provide a detailed explanation of how our courses are administered. We provide samples of our materials and a Demonstration Course so you may know what to expect should you choose to purchase our package. DRE Compliant : We work closely the Education and Research Section of the California Bureau Real Estate to maintain compliance with CE regulations. Quality Course Materials : Our materials are current, well-written, and relevant to the practice of California residential real estate brokerage. To view the first one third of any course’s textbook, including its table of contents, just click its name in the following list: Ethics , Agency , Trust Funds , Fair Housing , Risk Management , and Consumer Protection Reader. Yes. We are always available via e-mail and usually available by phone (818) 716-1028 during California’s business hours. Yes, all our courses have been extensively reviewed and approved by the California Bureau of Real Estate. I’m not computer savvy. Should I take your courses? Probably not. We assume you’re familiar with	your browser’s basics registering and paying for services, reading PDF files, linking to outside sites and returning, navigating pages, and printing. If you lack these basic computing skills you should use a school which offers CE via correspondence or classroom. If you are unsure you have the requisite online skills, try our Demonstration Course. If you can read its textbook, pass its 10-question exam, and print its certificate then you should have no trouble completing our packages. By taking the Demo you will also become familiar with our approach and earn a 15% discount on the purchase of our 45-Hour package. This course was TREMENDOUS. I recommend it highly. The materials were clear. I could study where and when I wanted. And not only did I qualify to renew my license, but, more trouble and keep smiles on my clients faces. Four stars, two thumbs up, this is the course to take. Hi,I just recently completed your course. I have been an agent for 21 years and taken many courses over the years. I have found that the content in the majority of courses, especially for continuing education and licensing requirements, has very little relevance to practicing real estate day to day. It basically feels like a waste of time. Your course, in particular the Consumer Protection Reader portion, is profoundly relevant and helpful for practicing day to day! It is truly the best content and style I have ever seen for helping agents have an overview of what they need to know to be a helpful and efficient to our clients. I think it should be mandatory reading for any agent, especially as a new agent license requirement. If you haven’t made this into a book that can be purchased, I think you should. With your permission, I would like to print the entire CPR and keep it for reference. Your whole site/ program is set up very well. I am so glad I found it. Congratulations, job well done!! Feel free to post this feedback on your site. I will be referring your site to other agents in my office. Thank you! Once a quarter we conduct a survey of our competitor’s prices of their 45-hour packages. Our last survey was conducted on April 18th, 2019. That survey revealed that our standard (undiscounted) price of $44.00 is the fourth lowest price available for any 45-hour package. A Massachusetts provider (CalOnlineCE) offers a $39 price, an Arizonan provider (CyberCE) offers a $35 price, and a Tennessean provider offers a $40 price. Our Demo-discounted price of $37.40 makes our offering the second lowest price available anywhere. First, the details you enter on our Payment Page (see figure at the bottom of this section) are sent by your browser to our server via a secure connection (using https protocol). This means your credit card number can not be intercepted by a hacker en route to our server. 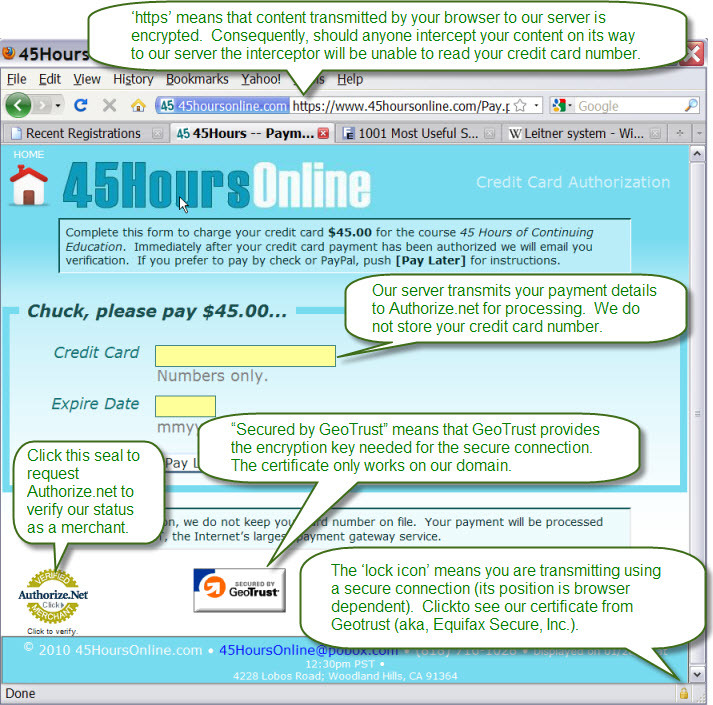 Second, your browser automatically verifies our site’s identity using an SSL certificate from Geotrust (aka, Equifax Secure Inc.) this means you can be confident youre sending your credit card number to us and not to a site pretending to be us. Third, our server transmits your payment details to Authorize.net, the Internet’s largest payment gateway. We do not record your credit card number in our database (except for the last four digits). This means that should anyone ever hack our site and steal our database they would not find your credit card number. We never know your credit card number. If we need to give you a refund, we do so by reference to a unique number assigned to your transaction by Authorize.net. 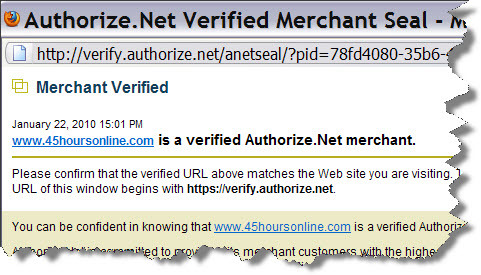 Fourth,you may verify our status as a registered merchant with Authorize.net by clicking their seal (we display it on our Payment Page see sample to left). When clicked, your browser sends our server’s domain name to Authorize.net. Authorize.net sends back a report which your browser displays in a popup window (see sample to right). The report states that the server’s domain is ours (not a domain pretending to be us) and that our domain is registered as a merchant with Authorize.net. If, in spite of our security, you still are not comfortable using your credit card, we’ll be happy to accept a check or PayPal payment. To pay by check	or PayPal, register first but when prompted for payment, push [Don’t Pay] instead of [Process Payment]. When you push [Don’t Pay], we give you instructions for mailing a check or for making a PayPal payment. What is the “Referral Discount"? To encourage our customers to tell other licensees about our services, we offer a 25% Referral discount. To take advantage of the Referral Discount, you must enter the license ID of a former customer when registering for one of our products. We	define "customer" as someone who has purchased one of our products and has passed at least one course (not including the Demo or our Practice course). The Demo Discount may not be taken with the Referral Discount. Yes. To pay by check, register without paying. To do this, register and when prompted for a credit card push [Pay Later] — the page which follows gives instructions for sending your check. When we receive your check, we will mark your online record as “paid” and send you a confirming email (which you will have entered when you registered). Your waiting period (the time you must wait before you can take your first exam) starts when we mark your registration record as paid. Since this method of payment is error prone due to glitches in mail delivery, please contact us by email (45HoursOnline@pobox.com) if you don’t receive payment confirmation within three business days. Note: If you don’t know what PayPal is, skip this FAQ. Register without paying. To do this, register for	the product you want but when prompted for a credit card push [Pay Later]. Log into PayPal, send your payment to 45HoursOnline@pobox.com. PayPal will automatically send us a notice of your payment. When we receive it, we will mark your registration record as “paid” and send you a confirming email. If you do not receive confirmation within one business day, you should contact us at 45HoursOnline@pobox.com. We always will give a full refund provided you haven’t passed any exams (other than the practice exam and the Demo). We will also give a full refund even if you passed some or all of your exams if your license has permanently expired (in other words, if you don’t renew your license within the two-year grace period following your license expiration date). Otherwise, we will give you a partial refund using a refund in the amount calculated using this formula: PERCENT-OF-UNPASSED-HOURS x .5 x COST. For example, if you passed only our three hour Ethics course in our 45HOURS package for which you paid $45, we will refund you 42/45 x .5 x $45=$21. To obtain a refund, please e-mail (45HoursOnline@pobox.com). Be sure to give your DRE#. We will need your DRE# to find your Authorize.NET approval code in our records (Authorize.NET is the payment gateway we use for processing your credit card payment). Please understand that we don”t store your credit card number and we dont need it to give you a refund. If you do request a refund, we would welcome knowing the reason but if you choose not to tell us we will provide your refund with no questions asked. We will also grant full refunds to students who, because of time restrictions, can not possibly renew their licenses on time or to licensees who are renewing late (within the two-year grace period) and because of time restrictions can not renew their license in time to avoid the permanent expiration of their license. If, because of DRE’s time restrictions, you can not possibly complete your CE in time to avoid a late fee, please do not call to ask us to make an exception for you. We wont. We will, however, give you a full refund at your request. The below screen shot informs the student that the final exam for the Ethics course will be available on Friday after 12:26p.m. (PST) and that the final exams for the remaining five courses will also be available after that date once the course’s corresponding quiz has been taken. Note the red check mark next to the word "Quiz": This means that the student has taken the quiz for the Ethics course. To get credit for a course one must pass its final exam but in order to take a course's final exam one must first take (not pass — there is no passing score) its quiz. When an exam is ready, the student will see a link reading Take Final.. The Four-Day Study Period should not be confused with the study period associated with each course. A course’s study period is the time you must study should you fail the course’s final twice in succession. During a course’s study period you may not take any final exams. To view the first half of any one of our five three-hour courses click anyone of the following: Ethics , Agency , Trust Funds , Fair Housing , and Risk Management . 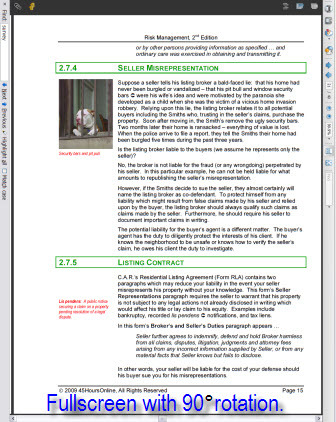 Click here to view the first 100 pages of the Consumer Protection Reader’s textbook including its table of contents. What purpose do the quizzes serve? The DRE made quizzes mandatory starting January 1st, 2011. That is, you must take (not pass) a courses quiz (or quizzes) before being permitted to take that courses final exam. We make available one quiz for each of our five three-hour courses and two quizzes for our 30-hour Consumer Protection Reader course. You must take a courses quiz to gain access to the course’s final exam. Each of our	quizzes has as many questions as does its corresponding final. Thus, for each of our five, three-hour courses, there are 16 quiz questions and 16 final questions; and for our two 15-hour exams (the exams for Part 1 and Part 2 of the final for our thirty-hour Consumer Protection Reader (CPR) course), we have 35 quiz questions and 35 final questions. Quizzes are nothing like finals. We do not require you to answer every quiz question but we do require you to answer every question on the final. Each quiz has no time limit, but each final has a time limit equal in minutes to its total number of questions. Many of the quiz questions are long, some difficult, some ambiguous, and some even tricky; while almost all final questions are short, straightforward, and unambiguous. But the most significant difference between a quiz and a final is that after the quiz we give you its answers whereas we are forbidden (by DRE rules) to give you the answers to the final. The answers we give you to the quizzes are detailed. For each quiz question, we give you not only its answer but a detailed explanation as to why it is the correct answer and, often, why the other proposed answers are wrong. All answers are supported with citations from the course text book. Our quiz explanations are presented as PDF files so that you may print them and study the answers. The types of questions on our final exams conform to DRE regulations; that is, a mix of multiple choice and true/false questions in the ratio of nine to one. All of our multiple choice questions have three possible answers. DRE regulations require a minimum of 15 questions for any three-hour course. For complicated reasons, each of our five three-hour courses have 16 questions. These same regulations require a minimum of 70 questions for any 30-hour course – which is the number of questions on our final for our 30-hour Consumer Protection Reader course. Finally, DRE regulations require a time limit for each final exam equal in minutes to the total number of questions on the exam. Thus, the time limit for our five, three-hour courses is 16 minutes and the time limit for our 30-hour Consumer Protection Reader course is 70 minutes (administered in two parts each). If you should run out of time when taking a final exam, unanswered questions are marked as “incorrect” and your exam is graded accordingly. The DRE limits the rate at which you may complete your CE to 15 credit hours during any 24-hour period. This rule is strictly enforced. Although you may take your exams in any order (except Part 2 of the Consumer Protection Reader), most participants choose to proceed as follows: first they pass the five three-hour courses at one sitting, then wait at least 24 hours, then pass Part 1 of the Consumer Protection Reader, then wait at least another 24 hours, and then pass Part 2 of the Consumer Protection Reader. This approach is simple and we recommend it. Suppose you completed the first four three-hour exams at one sitting in the order in which they appear on the Course Work page — Ethics, Agency, Trust Funds, and Fair Housing. The courses remaining would be the three-hour Risk Management course and the thirty-hour Consumer Protection Reader (CPR) course (which has an exam which must be passed in two parts). If 20 hours after having passed Fair Housing you logged back in, the only final exam available that would be available to you would be the three-hour Risk Management course. Part 1 of the CPR would not be available. Part 1 would not be available because if you were to immediately pass it you would have completed at least 18 hours of CE during the preceding 24 hours – a violation of the rule. Now suppose you logged into our system 24 hours (not 20 hours) after having passed Fair Housing. In this case our system would make available the exams for Risk Management and Part 1 of the CPR. If you immediately passed Risk Management, you would have to wait at least another 24 hours before being permitted to take Part 2 of the CPR. Conclusion: If you are only a few days away from your license’s expiration date, try to pass the five, three-hour courses at one sitting. If you fail the initial final exam, you may attempt to pass the course with its retake exam. The initial and the retake exams have the same number of questions but their questions are different. You may take the retake exam immediately after having failed the initial exam (or any time there after) BUT it is usually a good idea to do more studying to improve your chances of passing the retake exam. The amount of additional study you may wish to invest before making your second attempt depends on how badly you failed the initial exam. If you failed the exam by a narrow margin, you may need only a little more time to study. But if your score was closer to 38% – the score one would receive by chance alone – then you should consider studying much more. Investing additional study after failing a course’s initial exam is especially a good idea should (1) you fail Part 1 or Part 2 of the Consumer Protection Reader and (2) when your license is two to three days from its expiration date. In such a situation, failure of either part’s retake exam would require you to complete a two-day study period during which time your license would expire. If you renew late (after your active license expires), the DRE will require you to pay a “late fee” to renew your license. The late fee is 50% of the on-time renewal fee. If you are licensed as a salesperson and you renew late, you will have to pay $367 to renew your license instead of the on-time fee of $245 or if you are licensed as a broker or a corporation, you will have to pay $450 to renew your license instead of the on-time fee of $300. Should you fail a course’s final exam twice in a row, you must start over for that course – NOT THE ENTIRE PACKAGE – just the course. Starting over for a course means that you must (1) complete the study period for that course, (2) take the quiz (again) for that course (remember, there is no passing score on the quiz), and (3) pass the course’s initial exam or, if you should fail it, pass the course’s retake exam. Unlike some of our competitors, we do not charge you for taking a course over – one time or 101 times. When you fail a course’s retake exam and are forced into the study period for that course, you may not take any exam while you are in the study period. For example, if you fail both Ethics exams (initial and retake), you are then forced into the three-hour study period for that course. During that three hours we can not permit you to take any exams – not for the Ethics course and not for any course. The Certificate lists all courses you passed (to see a sample of the certificate, mouse over the arrow on the [Display Certificate] button on the below figure). 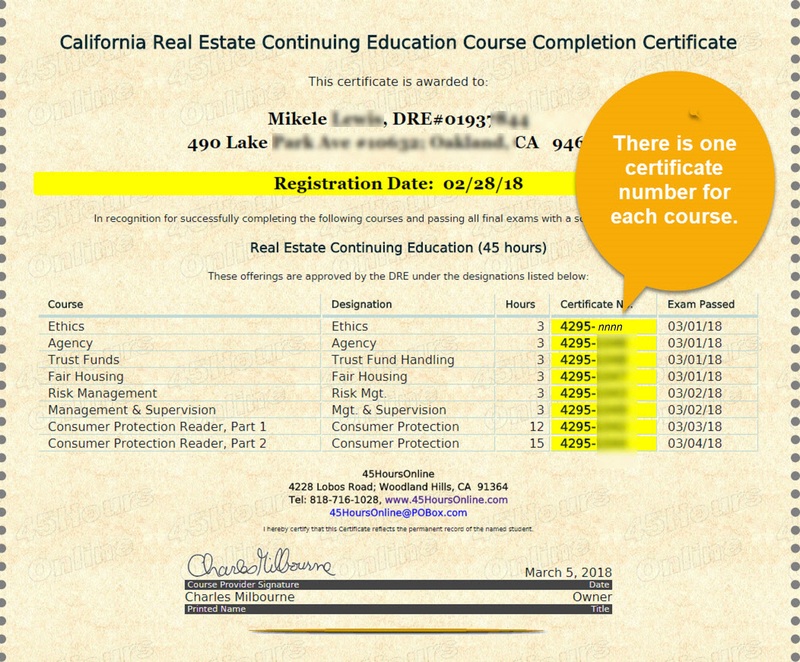 For each course, our Certificate shows the course’s “Certificate No.,” the date you passed, its name, and DRE’s official classification (aka, “designation”) for the course (e.g., “consumer services,” “consumer protection,” “risk management,” etc.). When you have passed all your courses, we provide you a link to DRE’s license renewal site named eLicensing. Their eLicensing site steps you through the process of renewing your license. In the course of renewing your license, DRE’s eLicensing site prompts you for the certificate number and corresponding date of completion for each CE course you have completed. In a final step, the eLicensing site prompts you for the payment of your renewal fee. As an alternative to eLicensing you may renew through the mail. If you are renewing a restricted license, an officer’s license, or if the address you have on file with the DRE is out-of-state, then you must renew by mail. We recommend all other licensees use eLicensing since it is the fastest and most reliable of the two methods (online v. mail). To renew by mail print DRE form RE#251: Continuing Education Course Verification and follow DRE’s renewal instructions as described here (and also on page two of the form). This form is used to list the CE courses you completed with their corresponding certificate numbers and dates of completion (which you will find on the Certificate we provide once you have completed your CE). What must I do to renew my license? Note: While you may complete your continuing education at any time during the term of your license, you may not renew your license with the DRE any earlier than three months prior to your expiration date. First print your certificate using the button from our Course Selection Page (the page following our Login Page). The certificate contains the details needed for renewing your license (see figure to right). Please note that there is not one certificate number but one certificate number for each course. When prompted by eLicensing: for each course, enter its (1) certificate number (e.g., ‘4295-nnnn’ — where ‘nnnn‘ is a four-digit course code), (2) completion date (e.g., ‘03/01/18’) and (3) your registration date (e.g., ‘02/28/18’ – the same date for all courses). After entering these three items, press the return key. Second, decide if you wish to renew via eLicensing (DRE’s online renewal service) or by mail. We strongly recommend DRE’s online renewal service it is immediate and final. Note: If you are renewing a restricted license, a corporate officer’s license, or if the address you have given to the DRE is out of state, then you must renew by mail. Note: If you have a salesperson license and you are employed by a broker then your broker must validate your renewal in a subsequent eLicensing transaction (eLicensing will provide you with instructions). Your broker’s validation is not required for your new license to be effective. If you are renewing by mail, you will need to print and complete form RE#251: Continuing Education Course Verification (see below note) and, if you are a salesperson RE#209: Salesperson Renewal Application or, if you are a broker, form RE#208: Broker Renewal Application. You then need to make out a check for your renewal application (for renewal rates click here) and then send in your check and forms to the DRE (the forms have instructions printed on page two). Note: If you renew by mail, do not send your certificate to the DRE. The purpose of the certificate is to list the certificate numbers and corresponding dates of completion for you to copy onto form RE#251. How can I pass your package in a little over six days? The soonest a participant may complete	our 45-Hours package is six days and three hours (give or take an hour). Study Time: Per our agreement with the DRE, we require each student spend at least six days studying the course textbooks before completing our 45-Hour package. Completion Rate: DRE limits students to the completion of 15-hours of CE in any given 24-hour period. Sally registers on Monday at 12:00p.m.. Our testing program schedules her for her first exams in four days (96-hours); that is, any time after 12:00p.m. on Friday. At 12:01pm on Friday Sally begins taking the exams for the five, three-hour courses (15 hours in total). By 1:00p.m. she passes all five exams. She now must wait until Saturday at 1:00p.m. to continue taking her exams. At 1:01pm on Saturday, Sally takes and completes the three-hour Management & Supervision course and the 12-hour Consumer Protection Reader, Part 1 course. By 2:00p.m. she passes both courses for a total of fifteen additional hours. She must now wait another 24 hours before she may take another exam; that is, she must wait until 2:00p.m. on Sunday. At 2:01p.m. on Sunday, Sally begins taking her final exam for Part 2/2 of the Consumer Protection Reader. She passes the exam by 3:00p.m. thus completing all 45 hours needed to renew her license. In this example, the elapsed time from when she registered to the time she completed all 45 hours was six days and three hours. We get this question a lot. No, we do not have a single comprehensive final examination that tests your understanding of the content for all courses comprising the package you purchased. All California real estate licensees require 45-hours of DRE-approved continuing education to renew their licenses. The only exception is for licensees who have held their license for 30 continuous years and are over 70 years of age (details). What if DRE’s renewal site is down on my license	expiration day? On rare occasions and usually during the weekends, DRE’s renewal site (eLicensing) goes down either for scheduled maintenance or due to a technical problem. If eLicensing happens to be down the day you wish to renew and if that day is your expiration day, the DRE may not grant you an extension. If eLicensing is down on your license expiration day and you must renew on that day to avoid a late fee, you should renew by mail. As long as your renewal application is postmarked by midnight of that day (or the next day for which there is mail service), the DRE will accept your renewal application without insisting you pay a late fee. You may complete your CE (i.e., pass your exams) at anytime during the term of your license or during the two-year grace period following the expiration date of your license. The two-year grace period begins the day after your license expires. If you renew on time, the four year term for your new license will begin the day after your current license expires but if you renew late it will begin the day after you renew. Can I apply my surplus CE to my next renewal? No, all CE hours must be earned during the term of your current license or, if your full license is expired, during the two-year grace period allowed by the DRE following your license expiration. The CE hours for a given course are earned upon passing the course’s final exam. Can I be exempted from my continuing	education. If you are over seventy years of age and have held your license in good standing for thirty years you may be eligible for an exemption. Click here for details. Our compact with the DRE requires us to enforce the waiting periods. Sorry. Why won't you let me see which answers I got	wrong? The final examination shall provide for the testing, examination or evaluation of participants. The sponsor shall take steps to protect the integrity of the examination and to prevent cheating in an examination. We do not enforce a “seat time” requirement nor does DRE require that we do so. Instead, we enforce an initial study period of four days to ensure that students have sufficient time to read their course materials. Seat-time is a requirement that each student spend at least the full number of course hours interacting with the course material. This requirement is enforced no matter how quickly the student reads or how well the student already knows the course material. For example, a seat-time requirement for a 15-hour course would require the student to maintain an online connection to its course material for a sum total of at least 15 hours across one or more online sessions. To maintain that connection, the student must press one or more keys every minute or so to indicate that he is actively reading the material. Should he fail to do so, then he must log back in to reestablish the connection. To ensure that the student isn’t just clicking through the course material without reading it, the CE provider requires the student to pass a quiz to prove his understanding of the most recently completed section before he will allow the student to move onto the next. A script is a computer program which writes web pages. The scripts written for this site control the basic student management functions: registering students, logging students into the site, displaying the status of the student’s courses, and administering the quizzes and final exams. eBooks may be read anywhere on the Internet or they may be downloaded to your laptop and read offline. eBooks may be printed (to save paper and ink, set your printer for two-up, two-sided printing). The text in eBooks may be magnified to any degree for easier reading. You may search the eBook for any string of words and you may access it through its table of contents (click the Reader’s bookmark icon to display the eBook’s table of contents). For maximum reading comfort, download an eBook to your laptop, rotate it 90 degrees, display in “fullscreen,” and hold the laptop on its side (see screen image to right) and cradle it on your lap the type will be large. And if your laptop is relatively new, the chances are that it will weigh less than a large paperbound book. Adobe Reader will even read the text aloud (mouse to a paragraph and toggle Ctrl+Shift+Y to activate the Reader’s Read-Out-Loud feature). Adobe Reader will permit you to highlight the text and add notes but to use this feature you must save a copy on your PC&rsqo;s hard drive. You can download and read our eBooks on your iTouch or iPhone (try mBrain Softwares PDF+ available at the iPod AppStore for $2.99 (as of November 2009)). For more information, read our paper Using Adobe Reader. To open a textbook while taking a test, do the following: (1) Login, (2) Click the PDF icon corresponding to the course for which you are taking the exam this opens the textbook in a new window/tab, (3) switch back to the originating window (using <Alt><Tab> or by clicking its tab), (4) Click [Take Test]. See the below figure for details. We keep your records indefinitely. You may login in at any future time to see your records; however, once you pass a final exam, you may not take it again. You can send your evaluation of our courses to the DRE by clicking here.